It's time for Halloween themed movies which usually mean horror. To my surprise I loved this fantastic animated movie with voices from Zoe Saldana, Channing Tatum, Christina Applegate and Ice Cube. It recreates the Romeo-and-Juliet story against the backdrop of the Mexican customs surrounding the Day of the Dead. I worried maybe the "skeleton" painted Day of the Dead characters may be creepy but they weren't at all. 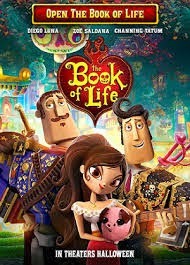 The Book of life has one of the most colorful and unique set designs I have every seen in an animated movie! The Land of the Remembered was especially visually stunning. It was nominated for best animated film at the Golden Globes last year. It's out on dvd now so check it out. Don't forget to re-watch Ghostbusters as well! On the topic of Halloween, if your office is allowing you to dress up on Friday, here are some work appropriate halloween costume ideas. Ghostbusters is also a must this time of year!